So I know I said I wasn't planning on doing (or monkeying with) any of these Silmarillion pieces digitally. 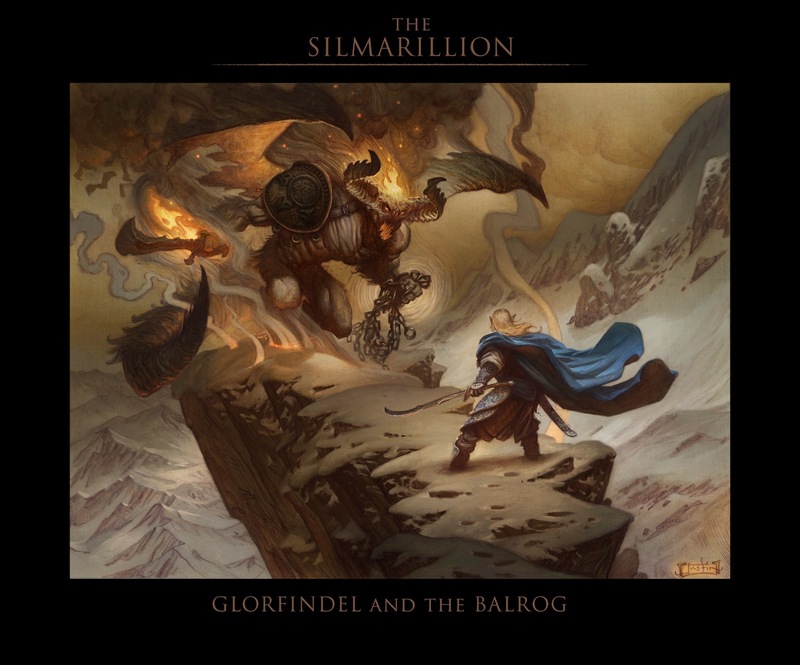 But I gave in and joined the Dark Side for a bit to push the Glorfindel and the Balrog piece a little further. I can't help it, sometimes I just have to monkey with the paintings. This version of the image is much more like the frame that was in my head originally, with a little more emphasis put on the fire and atmosphere. Hopefully the digital work doesn't affect the overall classic feel I was going for in the original. Having things turn out too synthetic looking is always a concern when painting in Photoshop. In the end, I just love pushing the traditional parts further on the computer. Like the Dark Side, Photoshop can be a lot of fun to work in once you really figure it out. But this is where it starts guys. One day your happily adjusting Photoshop dials, the next thing you know you've built a Deathstar and you're about to blow up Alderaan. Your digital overlay work is so subtle, yet punchy, that you need not worry about these pieces ever going too digital. Have to mirror Will Kelly's comment on MC ... please tell us more on how and what layers you use to get 'here'. You've mentioned there are thousands of layers, and I guess that is why your tutorial / article on the Satyr in ImagineFX didn't delve too much into it, but an overview of sorts would be highly appreciated. Again, superb work. A masterpiece! I am using a lot of different layers to achieve the lighting. Mostly though, it is just multiply. And the lighting ends up just being the absence of shadow. There are some screen layers and also some more normal layering in the highlights here and there, but not much. A tutorial on the method is really hard for me because I am always changing what layers I use on these pieces. Most of the time it is multiply, but i also tend to experiment with soft light, overlay and color burn occasionally. My guess is that most of the layers are very, very subtle (low opacity) and describe a journey towards the final, rather than a set path via GPS. Must say that sheen on the sword edge is outstanding and the cape of Glorfindel creates a landscape all in itself. Again, wonderful work. Justin. Gorgeous piece and I don't have a problem with using technology to enhance the foundation. However, I can't help feeling the geometry of the Balrog's horn is off. If it were symmetrical, the horn on the left as we look at it would be further in. I took the liberty of shoving it into place, here http://peterunderhill.blogspot.co.uk/ leaving the empty space to show where it was. Ha! Well, I actually thought the horn was off as well, but that it actually needed to go the other direction, curving in more, in order to be more symmetrical. But I liked the overall rhythm around the head too much to change it. This happens a lot, where I get attached to the look of an error in the watercolor, and then can't bring myself to change it in the final. It may get me shot some day, but I will occasionally sacrifice representational accuracy for energy. I know what you mean. Rather like Darkness' horns in Ridley Scott's Legend. It's still a great piece - one I'll not shoot you for. I prefer this to the original by a long shot. I love the appeal and texture of a traditional piece, but sometimes you just can't get the visual weight you want everything to have with those materials (oil maybe being the rare exception). Nice work pushing it where it should be! I really love this painting, and I really love the colors that you added digitally, you have a very unique technique with the water color and photoshop, It is very beautiful. Digital it up my good man! That piece looks fantastic. Oh, and as long as I'm not on Alderaan I'm fine with you blowing it up. Pieces like these bring a tear to my eye, in a good way. Very motivational, so please don't be so reluctant to do experiments such as this. Gorgeous! Your pieces look so much more punchy after you've Photoshopped them, that I really see no reason not to! I like both versions. The waterolor version has more of a fairytale flair to me, like a swift idea of the story, this version has way more impact as an illustration though. I would love to see a drawing or sketch of Melkor/ Morgoth, maybe together with Ungoliant. This is amazing justin! Your work looks fantastic with or without photoshop. I enjoy watching the evolution of a sketch from a traditional watercolor to a digital illustration. Your vision of Tolkien's world has been inspiring, I hope you stick with it even after the new movies this Christmas. Justin, I can't help but say... your art is inspiring. Cant wait to see what you do next.